Your reaction to being served the implausibly large bowl of “Japanese Loaded Fries,” misleadingly placed in the “Snacks & Sides” section of Yusho’s menu, will depend on a few things. Whether the writhing and curling mass of bonito tuna flakes it’s topped with—shaved so thinly that the heat waves of any dish they’re placed upon make them move as if each is some living thing—weirds you out. Whether you believe halfway through that the savory kimchi gravy coating everything, including your fingers, is enough of an obstacle for you to attempt the absurd but easy feat of eating French fries with a pair of chopsticks. And, ultimately, whether the remnants of the gravy-covered fries stuck to the bottom of the bowl remind you of the fries drenched in mild or hot sauce left over at the end of a wing dinner at Harold’s Chicken Shack. Across the street that restaurant looks the same as ever from Yusho’s big side windows, even as hungry patrons flock to the new kid on the block—this blue cube from the North Side that crash-landed across the street from CVS and plays Dirty Projectors records. Yusho is the second Matthias Merges restaurant to open in Hyde Park, following A10’s debut late last year. It’s also the city’s second Yusho—the original has been a hip fixture in Logan Square since 2011. Some in the foodie press have taken to calling the 53rd Street location “baby Yusho,” a moniker that gets across the compact size of the new space as well as the similarly small place it has in the city’s food scene compared to its big brother. But “baby” or not, the new Yusho is the latest major coup in the University of Chicago’s campaign to bring new restaurants to its tight corner of the South Side. But there’s a world of difference between the offerings on Yusho’s menu and the kind of European-inspired fare that has brought crowds to A10 and the similarly trendy Promontory over the past few months. Yusho serves up food from a imaginary Japanese street—one where the food carts play New Pornographers tunes from humble boom boxes and all the brick-and-mortar establishments have hired interior designers. Some of it seems authentic. The menu takes pains to make it all seem cool as well. You can order soy-glazed chicken “drummies” or fried chicken in a steam bun garnished with “spicy business,” for instance. There’s lots of ramen to be had, naturally. The “Logan Poser Ramen” is already a crowd favorite. You’d be forgiven for thinking that the skewered and breaded item that accompanies the dish’s generous helping of noodles is a fish stick, alongside the large square of seaweed partially submerged in the broth and a poached egg. But it’s actually a skewer of shredded pig tail, tender enough to be plucked apart with chopsticks and incorporated into the broth for salt and spice. In theory, anyway. The savory taste the Japanese call “umami” dominates both the dish and one’s palate with a dull heaviness owing to the weakness of the dish’s other flavors. The same is largely true of the “Ten-Buck Ramen,” a similar ramen bowl with a shredded chicken “matzo ball,” although the heat of the Thai basil and collection of other spices worked into the chicken add other flavor notes to even out that dish. A tiny charred octopus salad is a serviceable option for those seeking daintier fare. 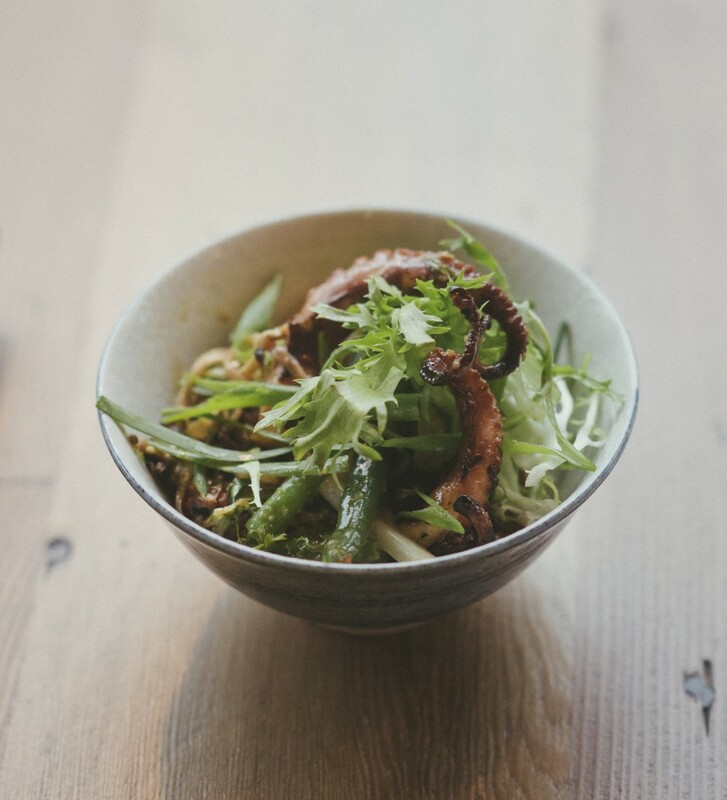 The octopus itself is salted just enough, and its chewiness meshes well with the texture of the greens and green beans. The salad also includes a cluster of enoki mushrooms, a variety that grows in thin spindles and tastes about as delicate as it looks. One of the most satisfying items on Yusho’s menu is even smaller than the salad. One could fit perhaps two of Yusho’s steamed pork belly buns into the palm of one’s hand. You only get one, but this seems fair given the amount of flavor and texture worked into those three or so bites: the tangy sweetness of the pork belly glaze, the tenderness of the pork belly chunks themselves, the tartness of the pickled cucumber, and the pillowy softness of the bun. The cinnamon soft-serve also demands to be tried, if only for the odd experience of eating something that tastes exactly like a cinnamon Pop-Tart with a spoon. The ice cream is topped with bits of another sugary breakfast treat—chunks of Cinnamon Toast Crunch melded with white chocolate that are described on the menu as “crunchy business.” It’s a whimsical item that clashes strangely with the rest of the menu. It’s also delicious. Yusho boasts a respectable alcohol menu—the product of a protracted legal battle with neighborhood residents over alcohol licensing that delayed the restaurant’s opening. Winning that battle was crucial for both Merges and the University—the project of making Yusho Hyde Park’s coolest new restaurant wouldn’t have been complete without sake and spirits. That project likely would have succeeded even if Yusho’s dishes did not. Fortunately, quite a few of them do.